Today Zsofia created a birthday card with a lovely sea them! She used those adorable manatees from our new Manatee-rific Stamp Set on this card today, giving them a fun birthday theme! She colored the manatees and cut them out using the coordinating Manatee-rific Die Set. This coordinating die set cuts around the arms of the front facing manatee, making it easy for him to hold an item in his arms. 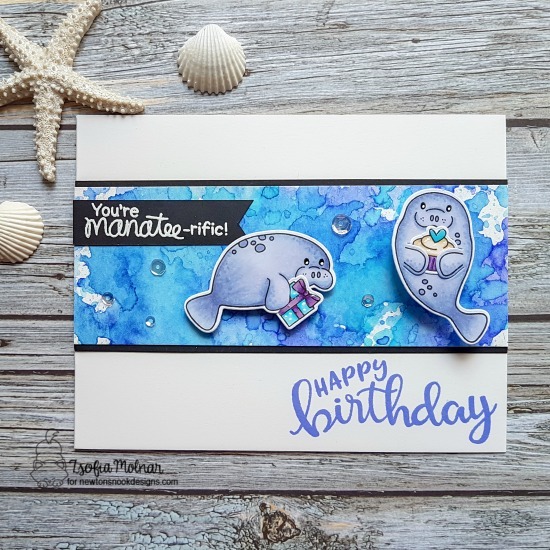 To give this card a birthday theme, Zsofia used the cupcake image from our Sending Hugs Stamp Set, which fits perfectly inside the manatees arms! She also added a gift for the the other manatee to hold, using the Sending Hugs Stamp Set and fussy cutting around the manatee arm to layer the gift underneath! So adorable! 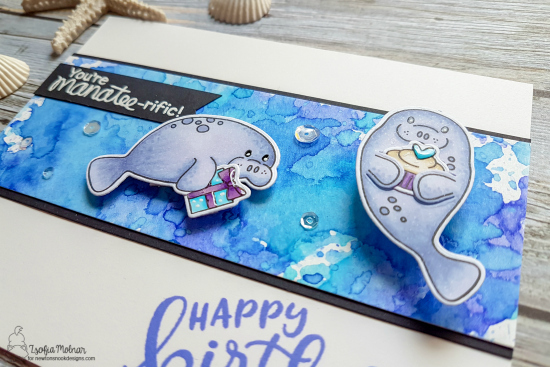 Once her manatees were ready to celebrate a birthday, she added them onto her card, layering them over a gorgeous panel of blue splashes that was created with Distress Inks. She also added the "You're Manatee-rific" sentiment, embossed in white on a black banner. She finished the card off with the "Happy Birthday" sentiment from our Birthday Essentials Stamp Set, stamped in blue! What a great way to extend your summer stamps by adding a birthday theme! Super cute! The inky background looks fantastic and the manatees are just darling.